Dangote gives N500m to Kano traders – Royal Times of Nigeria. Africa’s richest man, Aliko Dangote has redeemed his promise by donating N500million to thousands of traders affected by the Kano Market fire disasters few months ago. 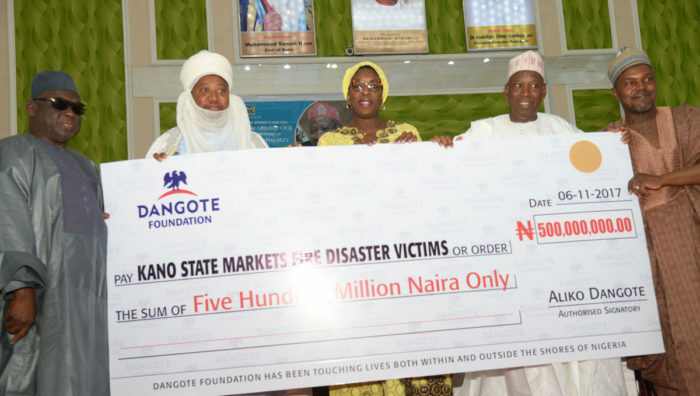 Aliko’s donation which came through the Aliko Dangote Foundation, was in response to the appeal by the Kano state government for contributions from public spirited individuals and corporate organizations to help the fire victims come back to business. No fewer than seven fire disasters have occurred in five major markets across the state within the past few months with no fewer than 1,400 shops and goods estimated at N28 billion gutted by the inferno. The state government had in the wake of the last disaster in February, which affected Singa market, set up a judicial commission of enquiry and an appeal committee headed by Alhaji Dangote and another businessman, Usman Tofa, both indigenes of Kano to help raise funds to help the fire victims, most of whom lost everything they sell to the disaster. Dangote, after the inauguration of his committee pledged N500m and assured the traders that his committee would work assiduously to garner funds to ameliorate the suffering of the traders. Presenting the N500m cheque on Monday afternoon in Kano, the CEO of Aliko Dangote Foundation, Mrs. Zouera Youssoufou explained that Africa’s richest man was deeply touched by the plight of the affected traders and that is why he has ensured that the money is available. Reechoing what Dangote said earlier on his involvement in the provision of succor to the traders, Mrs. Youssoufou stated that the Chairman of Dangote Group (http://Dangote.com) would also see other areas he would collaborate with the state to bring relief to the traders as quickly as possible. She stated that Dangote Foundation has been identifying with various projects in the state and that the donation is just one of the many interventions of the Foundation in Kano state. In his address of welcome at the ceremony, the State Commissioner for Commerce, Industry, Cooperative and Tourism, Hammed Rabiu commended Alhaji Dangote for the good gesture and said the state would be eternally grateful for the many helps he has rendered to the state in times of need. “As you can see, with this physical donation, Alhaji Dangote did not just talk by promising assistance, he is walking the talk”, he stated. Speaking on the donation, the state governor, Dr. Abdulahi Umar Ganduje while thanking Dangote for always rising to the occasion anytime the state calls, urged other Kano sons and daughters to emulate him and contribute to the growth of the state. He said that the state government had also donated N500 million to the victims pointing out that a judicial commission was set up to probe the fire incidents and make recommendation and had since turned in its report which has been guiding the state in taking certain decisions to forestall future occurrence. As part of the implementation of the recommendation of the Commission, Ganduje stated that the government had commenced structural designs and road projects at Kantin Kwari market. Also he disclosed that lock-up shops have been built for the traders as opposed to the former wooding stalls which are very combustible in the event of fire outbreak. The Governor assured that every trader that suffered loss would be compensated as the Commission had already accessed the extent of damages and the actual loss suffered by each trader. With the new development and strategy being out in place, Governor Ganduje said he hoped that the outbreak of fire in Kano markets will stop.